Location: Great Corby, Cumbria, England. Notes: Corby Castle is an ancestral home of the Howard family situated on the southern edge of the village of Great Corby in northern Cumbria, England. It was originally built in the 13th century as a red sandstone tower house by the Salkeld Family, who also owned the nearby Salkeld Hall of similar age. It was sold in 1611 to Lord William Howard, the third son of Thomas Howard, 4th Duke of Norfolk, who added a two-storied L-shaped house onto the peel tower. The present faade was built for Henry Howard by Peter Nicholson between April 1812 and September 1817. Henry Howard had inherited the estate from Sir Francis Howard, Lord William Howard's second son. In late 1981 Corby Castle was used as one of the main locations for the shooting of a five-part BBC Miniseries. The dramatisation of Wilkie Collins' The Woman in White, starred Diana Quick as Marian Halcombe. Corby Castle was sold by Sir John Howard-Lawson Bt. and Lady Howard-Lawson in 1994 to Northern Irish businessman Edward Haughey. 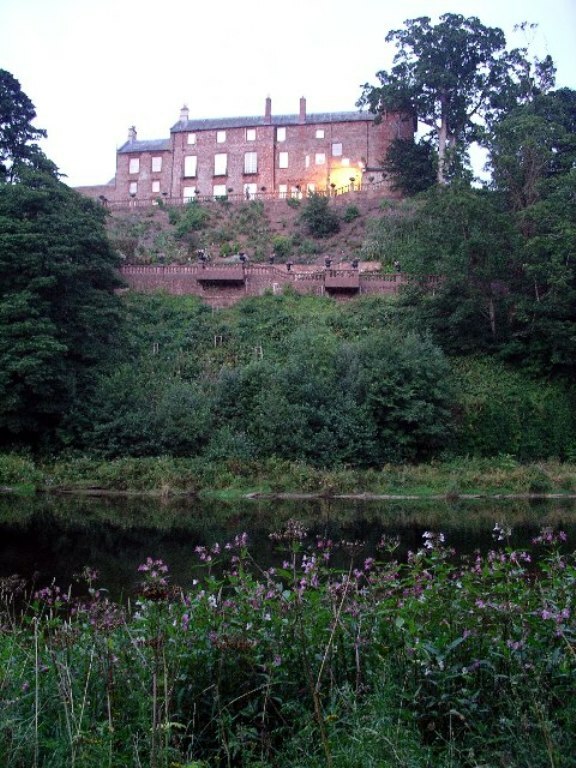 The principal contents of the Castle were sold in 1994 through Phillips of Scotland. Dr Edward Haughey, Baron Ballyedmond (a life peer, represented the Ulster Unionist party in the House of Lords) and carried out a total refurbishment of Corby Castle, and used it for both family and corporate entertainment. The castle is reputedly haunted by a ghost known as 'the radiant boy'. Corby Bridge, a Grade I listed railway viaduct of 1834, is nearby. "Corby Castle - Mysterious Britain & Ireland"